The Murrindal River Truss Bridge on Basin Road was built in 1927 and consists of a single timber Howe truss span and five stringer approach spans, supported on timber trestles fixed to concrete piers. The Developmental Roads Act, designed to provide improved access from remote areas to main roads and railways, was pushed through by the incumbent Country Party government in Victoria in 1918 and was administered by the Country Roads Board (CRB). A large proportion of Developmental Act works, including improvements to existing roads as well as new roads, were undertaken in the hilly districts of Gippsland, the north-east of Victoria and the Otway and Heytesbury Forests. The Basin Road, which accessed The Basin and later Jackson's Crossing, was surveyed in 1900 and was completed by c1909. The road was declared a Developmental Road in 1918 and in 1920-21 the CRB provided funds for substantial works. In 1923 the Acting Premier and the Chairman of the CRB visited Basin Road as part of the East Gippsland section of a "bad roads tour". In 1925-26 further road works were funded by a special grant under the Unemployment Act. In 1926 Developmental Road funding was approved for a new bridge over the Murrindal River, which was built under direct CRB supervision. The CRB described the bridge in its Annual Report as "virtually a viaduct". The bridge is now closed to vehicular traffic and has been made suitable for pedestrian use, with a new concrete road bridge built upstream. This six-span Murrindal River bridge consists of five stringer approach spans of thirty feet (9.1 m) and one eighty foot (24.5 m) timber Howe truss span of a standard CRB design. This simple truss design was suited to fabrication in remote areas and was used extensively from 1919 to the late 1920s. The western approach spans are widened and gently curved. The transverse deck remains in place and is unusual in that the timbers are spaced approximately half their width apart, possibly to improve longevity. Until recently the deck was topped by two strips of running-planks for motor vehicles, but it is now completely covered in longitudinal planks. The timber trestles supporting the truss and the girder approach spans are supported on mass concrete piers. True timber trestles, as found here, are rare in Victoria. The outer ends of the approach spans are supported by buried timber piers. The Murrindal Bridge is located in a striking high-country landscape setting, on a winding road, crossing a fast-flowing river in a steep-sided wooded valley and with an impressive hilly backdrop. The Murrindal Bridge is of scientific (technological), historical and aestheticsignificance to the State of Victoria. The Murrindal River Truss Bridge is of scientific (technological) significance at a State level as a rare example of a timber truss bridge. It is one of only four timber truss bridges remaining in the State. Within that group it is also a rare and intact example of a timber Howe truss span made to a standard Country Roads Board (CRB) design, with the only other extant examples being the three-span Genoa River Bridge and the single span Glenmaggie Bridge. The Murrindal River bridge is one of only two remaining single-span CRB truss bridges. Its significance is enhanced because it is accompanied by timber stringer approach spans and timber trestle supports, which are consistent with the timber technologies that accompanied most of the single truss spans built in the State. The Murrindal River Truss Bridge is of historical significance as a representative example of the types of works funded by the Country Roads Board under the Development Roads Act 1918. The bridge and the associated roadworks were a very substantial investment in a road which serviced a small and otherwise-isolated hinterland consisting of The Basin and Jackson's Crossing. As such it is representative of the goals of the Development Roads Act. The Murrindal Bridge is of aesthetic significance for its placement in a striking high-country landscape setting, on a winding road, crossing a fast-flowing river in a steep-sided wooded valley and with an impressive hilly backdrop. .
1. All of the land marked L1 on Diagram 2311 held by the Executive Director being part of Crown Allotment 3C Section F Parish of Buchan. 2. 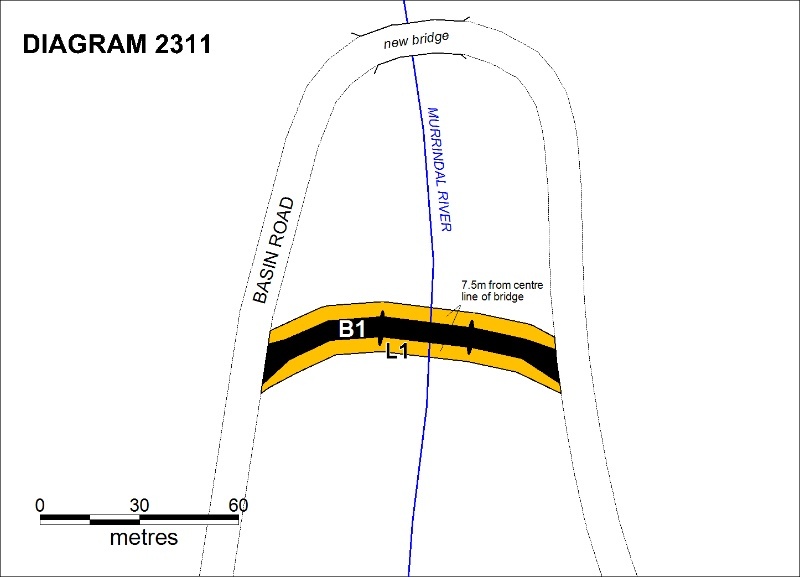 All of the structure marked B1 on Diagram 2311 held by the Executive Director. In January 1926 the CRB allotted £5000 funding for a new bridge over the Murrindal River on Basin Road. (Argus, 12 January 1926 p.6.) In June 1926 the CRB invited tenders for Contract 162 SP/69, a 230 foot long bridge on Basin Road over the Murrindal River along with 200 feet of approaches. (Argus, 14 June 1926 p.5) A tender had been accepted by the end of the 1925-26 financial year. (Country Roads Board 1926 p.96) The bridge was completed in 1927. (Buchan Sesquicentenary Committee 1989 p.66) It was used as an exemplar of the year's projects in the 1927-28 annual report of the CRB, alongside a description of its close relative, the Genoa River bridge. Adams, J. (1981). The Tambo Shire Centenary History. Bairnsdale, Tambo Shire Council. Buchan Sesquicentenary Committee (1989). Bukan-Mungie: 150 Years of Settlement in the Buchan District - 1939-1989. Bairnsdale, Buchan Sesquicentenary Committee. Country Roads Board (1926). Country Roads Board Thirtheenth Annual Report for the Year Ended 30th June 1926, Country Roads Board. Country Roads Board (1929). Country Roads Board Fifteenth Annual Report for the year ended 30 June 1928. Melbourne, Country Roads Board. Country Roads Board (1963). Country Roads Board Victoria 1913-1962: Fifty Years of Progress. Melbourne, Country Roads Board. b. Possession of uncommon, rare or endangered aspects of Victoria's cultural history. 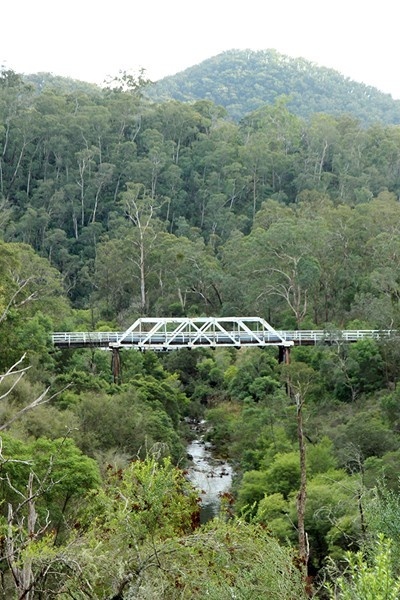 The Murrindal River Truss Bridge is of technological significance at a State level as a rare timber truss bridge. It is one of only four timber-truss bridges remaining in the State. Within that group it is also a rare and intact surviving timber Howe-truss span made to a standard CRB design, with the only other extant examples the three-span Genoa River Bridge and the single span Glenmaggie Bridge. This Murrindal bridge is one of two remaining single-span CRB truss bridges. Its value as a survivor is enhanced because it is accompanied by timber stringer approach spans and timber-trestle supports, which are consistent with the timber technologies that accompanied most of the single truss-spans built in the State. d. Importance in demonstrating the principal characteristics of a class of cultural places or environments. 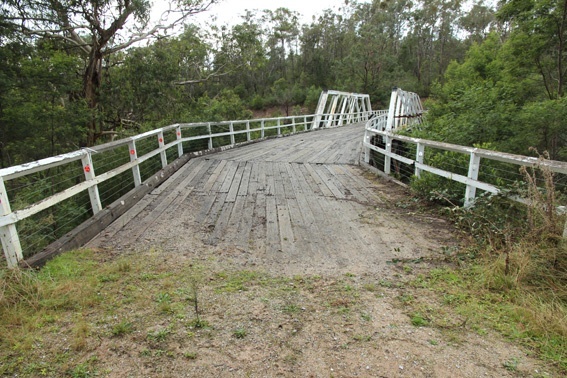 The Murrindal River Truss Bridge is of historical significance to the State of Victoria as a representative example of the types of works funded by the Country Roads Board under the Development Roads Act 1918. The bridge and the roadwork which originally accompanied it was a very substantial investment on a road which serviced a small and otherwise-isolated hinterland consisting of The Basin and Jackson's Crossing. As such it is representative of the goals of the Development Roads Act. e. Importance in exhibiting particular aesthetic characteristics. The Murrindal Bridge is of aesthetic significance for its placement in a striking high-country landscape setting, on a winding road, crossing a fast-flowing river in a steep-sided wooded valley and with an impressive hilly backdrop. 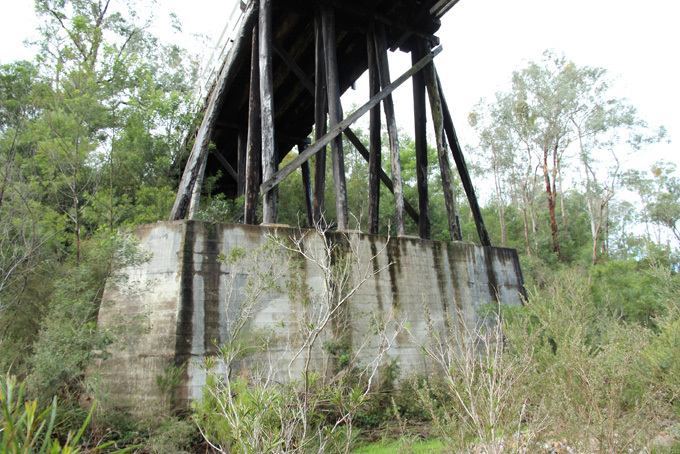 Completed in 1927 with Developmental Roads Act funding, the timber technology of the stringer approach spans and trestles complements the main span of now-rare timber trusses of standard Country Roads Board design. General Conditions: 1. All exempted alterations are to be planned and carried out in a manner which prevents damage to the fabric of the registered place or object. General Conditions: 2. Should it become apparent during further inspection or the carrying out of works that original or previously hidden or inaccessible details of the place or object are revealed which relate to the significance of the place or object, then the exemption covering such works shall cease and Heritage Victoria shall be notified as soon as possible. Note: All archaeological places have the potential to contain significant sub-surface artefacts and other remains. In most cases it will be necessary to obtain approval from the Executive Director, Heritage Victoria before the undertaking any works that have a significant sub-surface component. General Conditions: 3. If there is a conservation policy and plan endorsed by the Executive Director, all works shall be in accordance with it. Note: The existence of a Conservation Management Plan or a Heritage Action Plan endorsed by the Executive Director, Heritage Victoria provides guidance for the management of the heritage values associated with the site. It may not be necessary to obtain a heritage permit for certain works specified in the management plan. General Conditions: 4. Nothing in this determination prevents the Executive Director from amending or rescinding all or any of the permit exemptions. General Conditions: 5. Nothing in this determination exempts owners or their agents from the responsibility to seek relevant planning or building permits from the responsible authorities where applicable. Minor Works : Note: Any Minor Works that in the opinion of the Executive Director will not adversely affect the heritage significance of the place may be exempt from the permit requirements of the Heritage Act. A person proposing to undertake minor works must submit a proposal to the Executive Director. If the Executive Director is satisfied that the proposed works will not adversely affect the heritage values of the site, the applicant may be exempted from the requirement to obtain a heritage permit. If an applicant is uncertain whether a heritage permit is required, it is recommended that the permits co-ordinator be contacted. Emergency Works: Emergency works to maintain public safety and to protect the bridge structure.